Strawberry Churro with chocolate dipping sauce from the Churro Cart at Sleeping Beauty Castle. 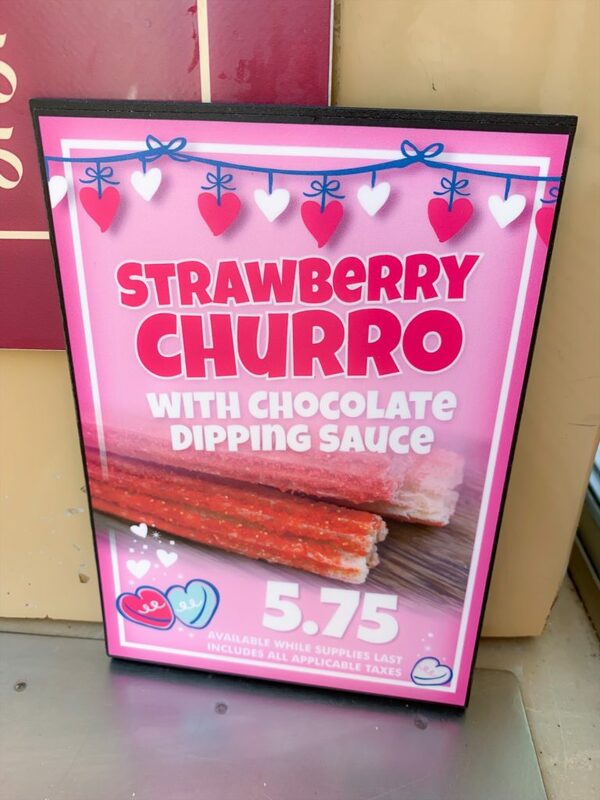 It is a tart strawberry churro, think Sweetarts candies, served with Hershey chocolate syrup. I didn’t really dig the chocolate sauce. I would have preferred a warm chocolate dip versus this one. But once I ditched the sauce, I really got into this churro and this is from a girl who is not into tart candy. 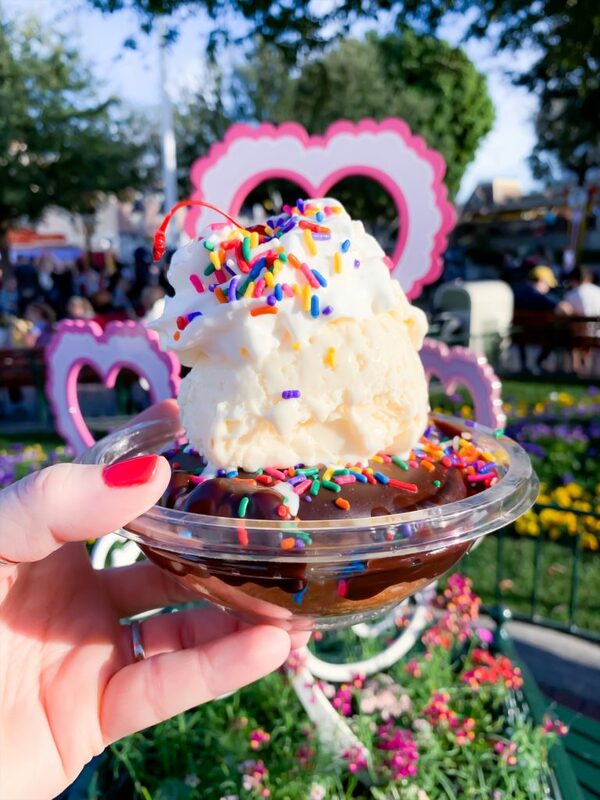 Sweetheart Donut Sundae from Gibson Girl. Warm glazed donut with a scoop of vanilla ice cream, hot fudge, whipped cream, sprinkles, and a cherry on top. I loved this sundae! The warmth from the donut and chocolate sauce made the ice cream extra creamy and I always enjoy the crunch of sprinkles. It is easily sharable, for you and your Valentine. 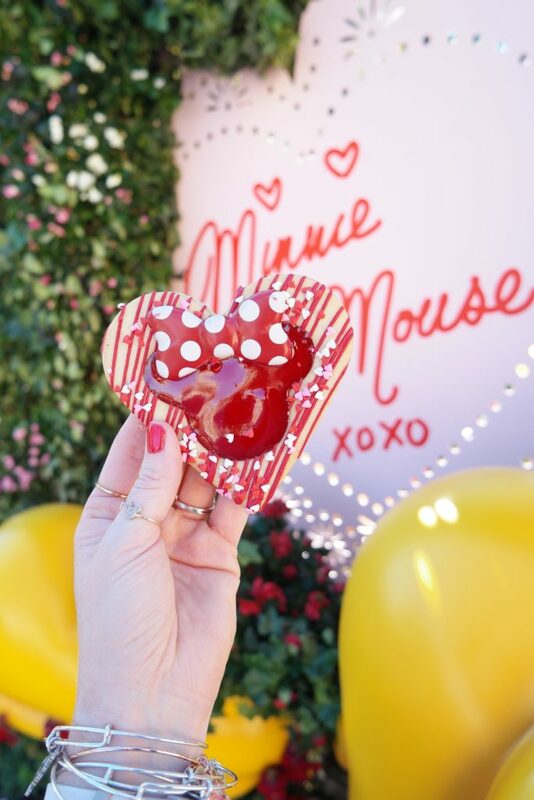 Heart shaped Mousse Dessert from Jolly Holiday. Raspberry mousse with vanilla bean crème brûlée center. I’m going to be honest. Did not love this at all! I didn’t care for the gelatinous outer layer or the raspberry mousse. It was a pass for me after one taste. Now the delivery was cute, edible gold leaf, heart shaped, liked all of that. Heart-shaped Linzer cookie from Market House on Main Street U.S.A. (aka: Starbucks). There always seems to be an abundance of shortbread cookies at Disneyland and I’m not mad about it. They go great with coffee and are always fancied up so Disney. The Linzer cookie is an orange zested shortbread, filled with jam and topped with another shortbread cookie. 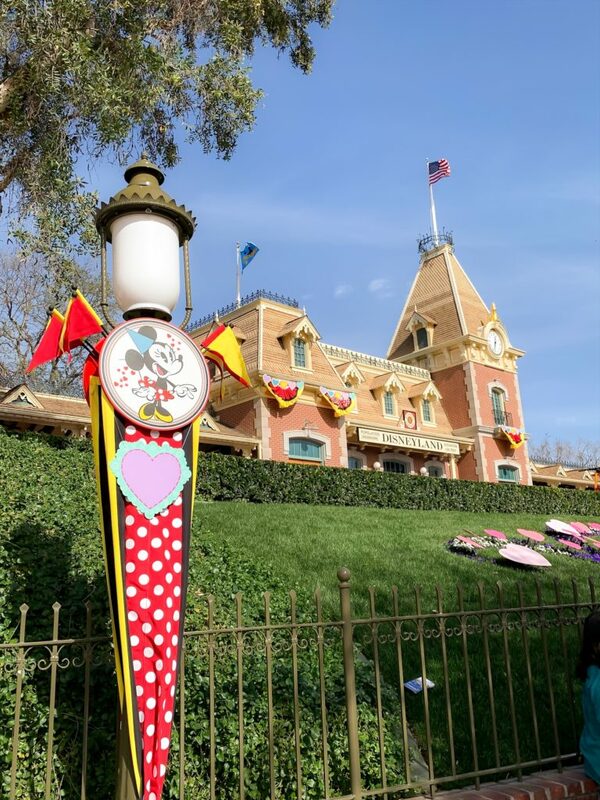 Only it was given a polka dot bow, especially for Minnie. So adorable! 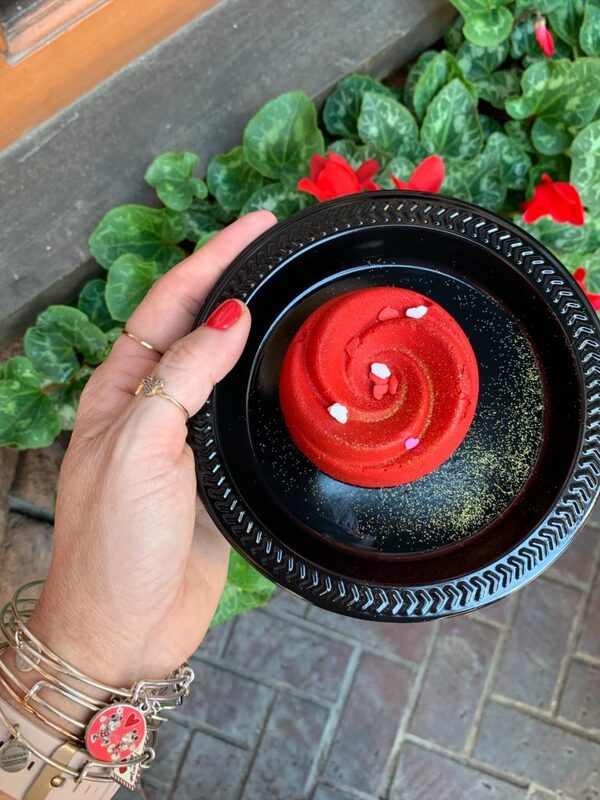 Cherry Mousse Dessert from Red Rose Taverne in Fantasyland. 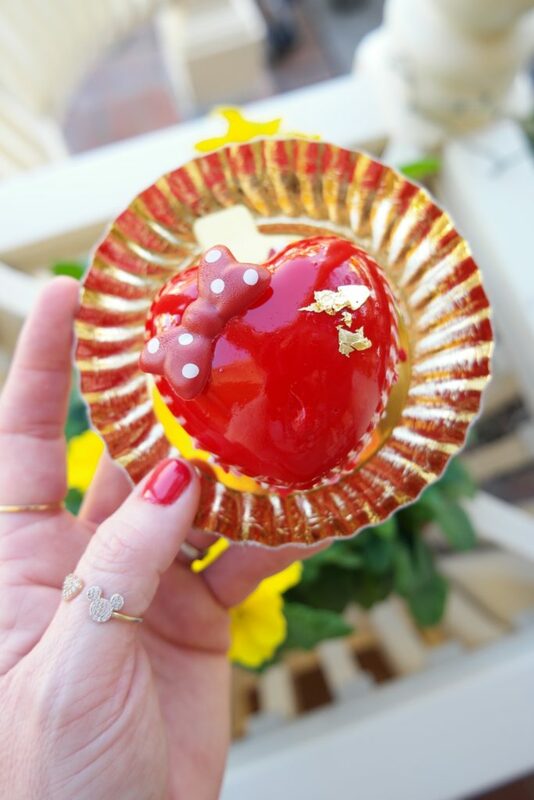 This rose shaped dessert has cherry mousse, dark chocolate ganache and chocolate crunch with red velvet spray, pretty dusting of gold, and mini heart sprinkles. As pretty as the dessert is, I wasn’t a huge fan. If anything, the similar mousse dessert from Jolly Holiday taught me that I am not into fruit flavored mousse. But I enjoyed the chocolate parts once I got through the cherry mousse. 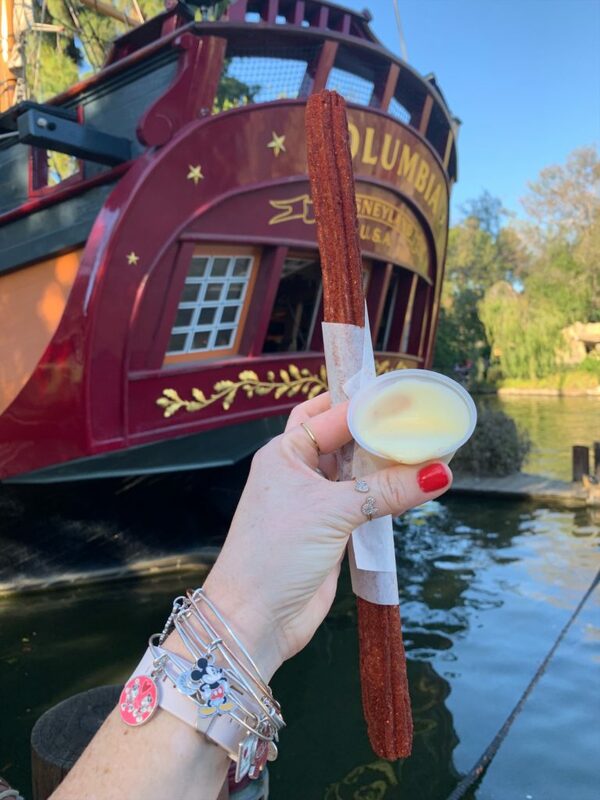 Chocolate-Cinnamon Sugar-dusted Churro with spicy cocoa dipping sauce from the Churro Cart in Frontierland. 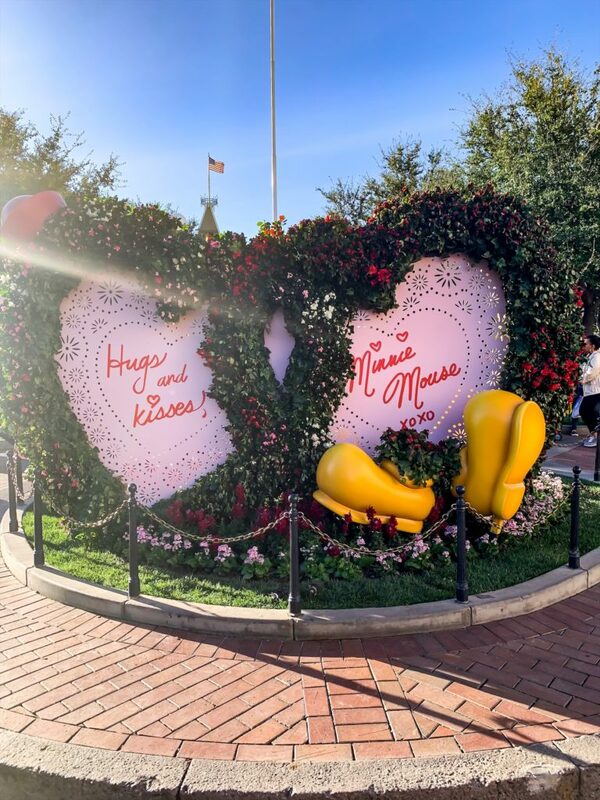 This was a true fan favorite from Pixar Fest this past Spring/Summer. I was very happy to see it make a return! It’s a chocolate churro coated in cinnamon and cocoa powder, served with a spicy chocolate dip. 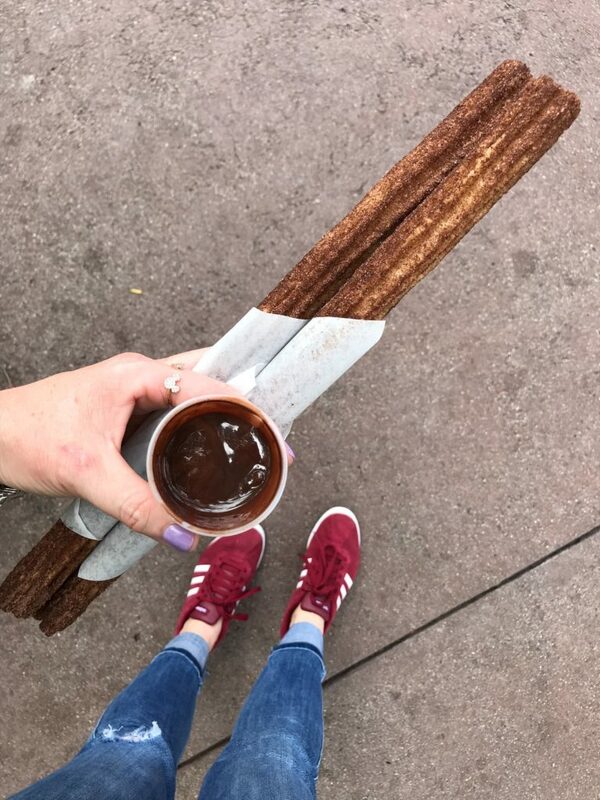 I’ve had this churro several times and it has yet to disappoint. 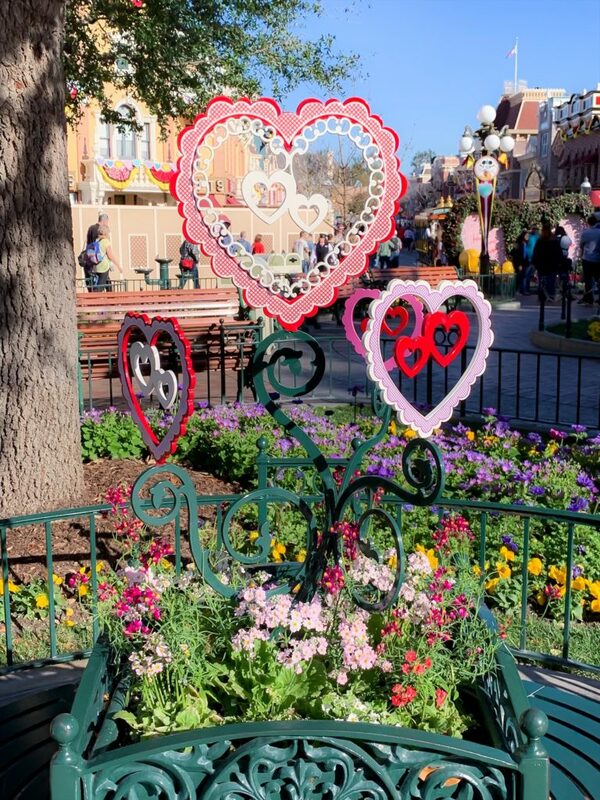 Burning Love Valentine’s Churro from the Churro Cart at Haunted Mansion in New Orleans Square. 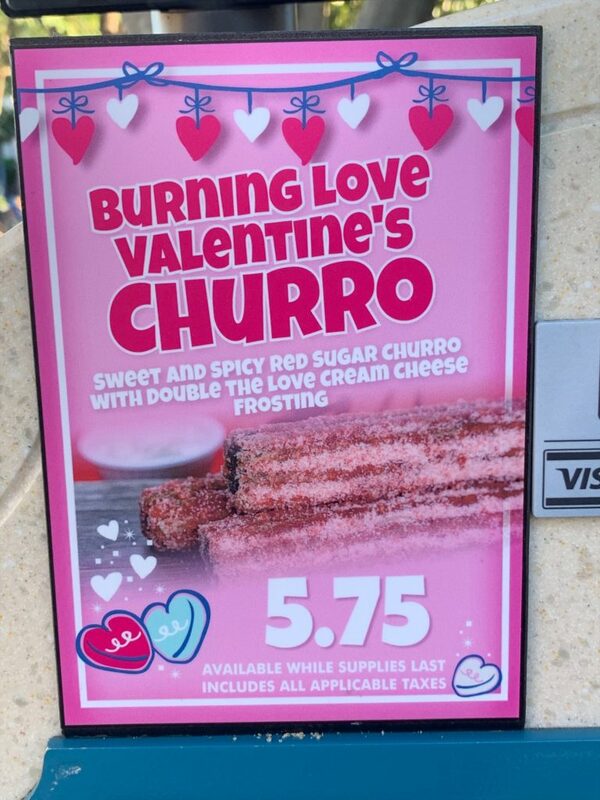 Sweet and spicy red sugar churro with what Disney called “double-the-love” cream cheese frosting. 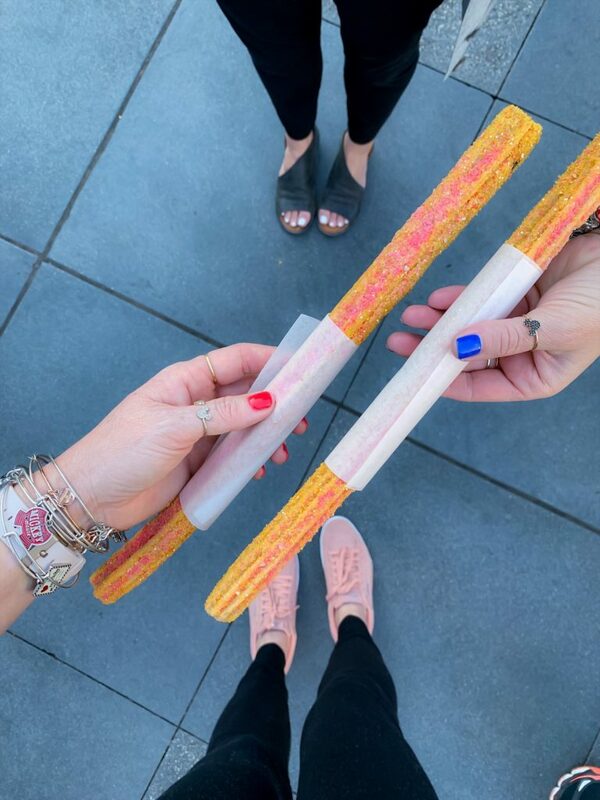 I went into this churro thinking it would be just like the Caliente churro from Senor Buzz on Pixar Pier, but it was much different. It wasn’t quite as artificial tasting as the Caliente churro from Senor Buzz, which is a lot like Red Hot candies, more of an intense warm cinnamon flavor. The cream cheese dip was a nice tartness to ease you into the spice a little. I liked this churro and didn’t really expect to be wowed by it, but I would get it again. 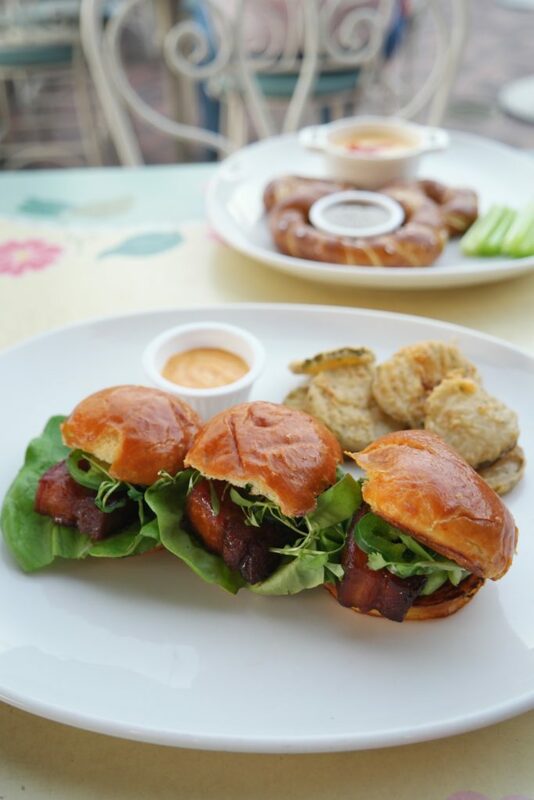 Southern Pork Belly Sliders from River Belle Terrace in Frontierland. Glazed pork belly sliders on toasted brioche buns with fresh sliced jalapeños, also served with house-made pickle chips and a remoulade dip (similar to Café Orleans famous Pommes Frites dip). Mind blown! These sliders need to remain on the menu. Can’t go wrong with a sweet & spicy pork belly glaze, the thinly sliced fresh jalapenos are such a great little kick of extra spice. The sliders are also adorned with fresh lettuce and micro greens. The pickle chips, almost topped the sliders. Dare I say better than Carnation Café’s fried dill pickle spears. We definitely did not leave a single chip on the plate and the dip pairs well with them. This dish can be shared with two, if you are hoping to enjoy more treats, but also the perfect size meal for one. 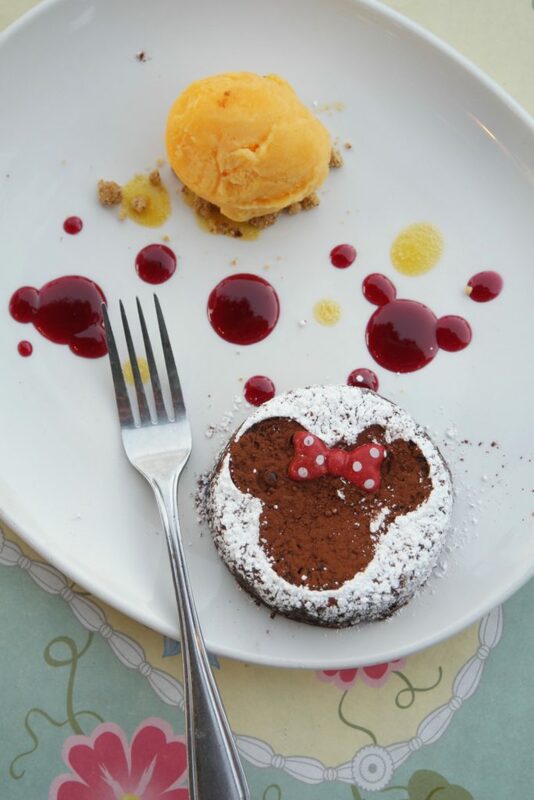 Chocolate Lava Cake from River Belle Terrace in Frontierland. Oh boy, this cake! It is a warm chocolate cake with passion fruit sorbet, passion fruit and raspberry sauce. 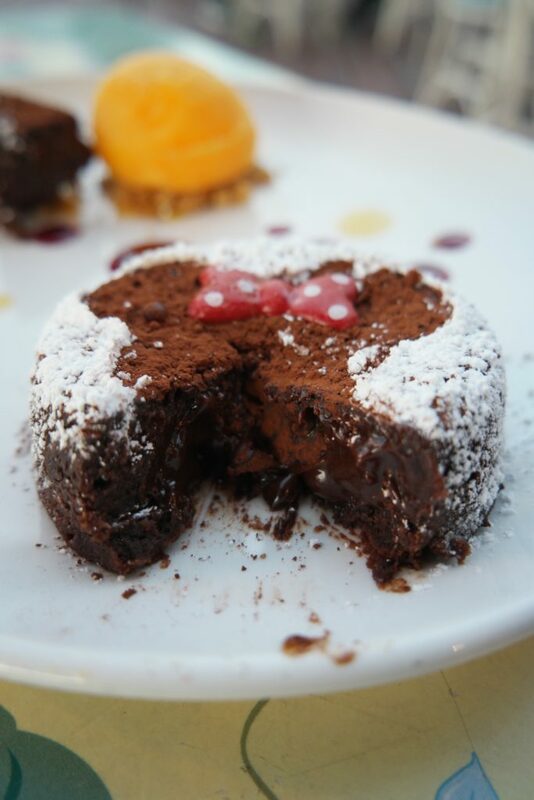 Lava cake combines the elements of flourless chocolate cake and soufflé. It is given and name lava because of its liquid chocolate center. Ours had a little ooze to it, probably a little more if we had cut into it as soon as it hit the table. But it didn’t change a thing about this amazing dessert! The tart sorbet and fruit sauce on the plate complimented the rick chocolate cake so well. I was doing the food happy dance with each bite! 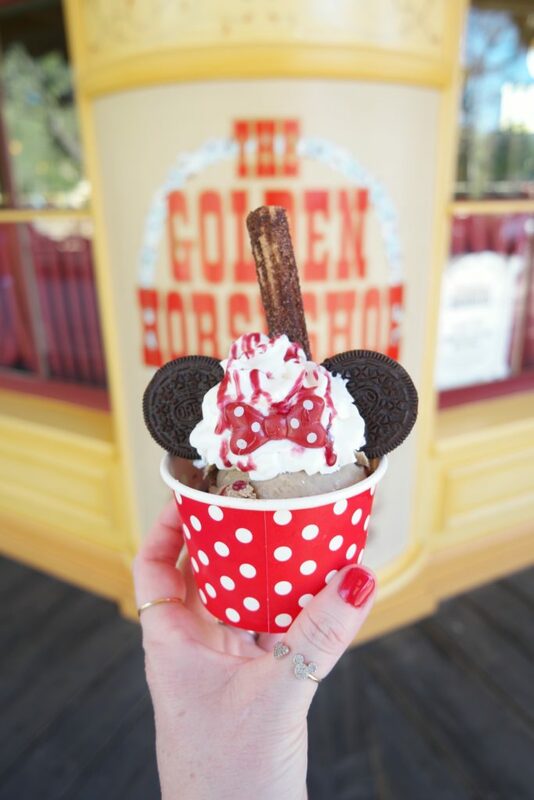 Minnie-inspired Sundae from The Golden Horseshoe in Frontierland. 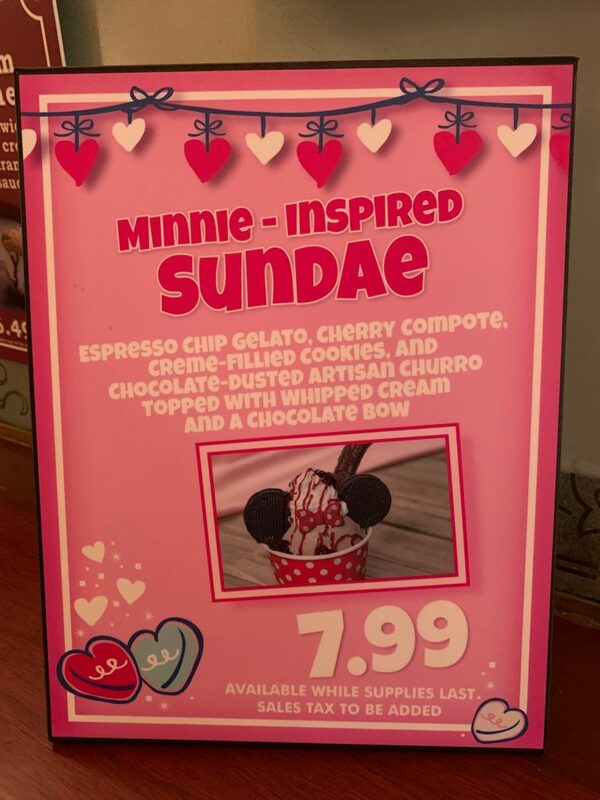 This sundae consists of Espresso chip gelato, cherry compote, cream-filled cookies, and chocolate-dusted artisan churro topped with whipped cream and a chocolate bow to mirror Minnie. I’m going to be honest, loved the chocolate churro and espresso gelato, but for me the cherry didn’t work. Cherries and espresso just don’t belong together in my mind and apparently my taste buds agreed. I definitely would have all of the other components together again, but hold the cherries. 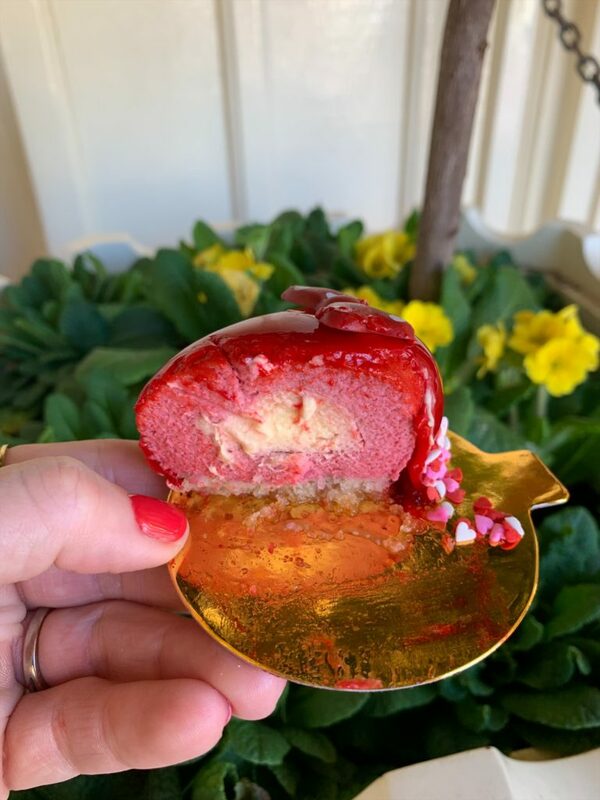 Strawberry Cheesecake “Funnel of Love” from Stage Door Café in Frontierland. Made to order Funnel cake covered with cheesecake filling, strawberry compote, whipped cream, and a chocolate bow. 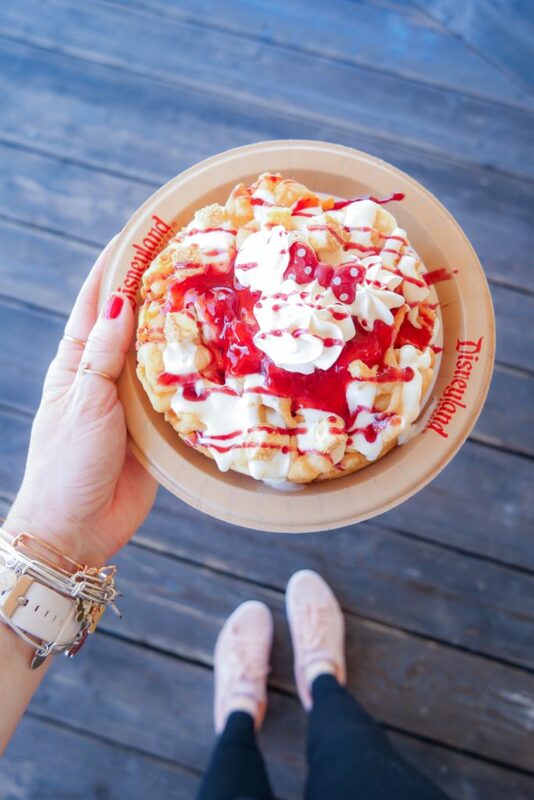 We could not stop ourselves from devouring this funnel cake, no matter how many churros we had already consumed. It tasted like we were eating deep fried cheesecake. 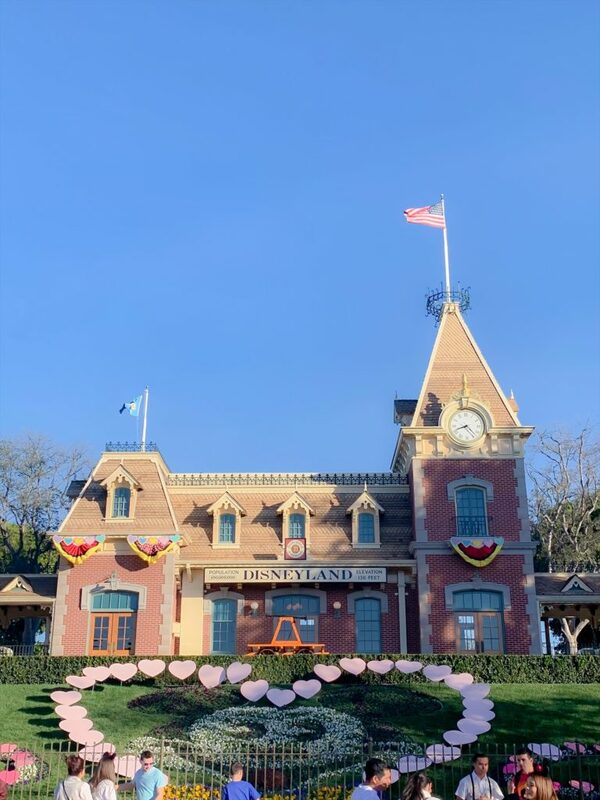 I probably only indulge on a funnel cake once a year at Disneyland (funnel fries not included), considering it is only February, this funnel cake set the bar high for any future funnel cakes to cause me to break my annual allotment. 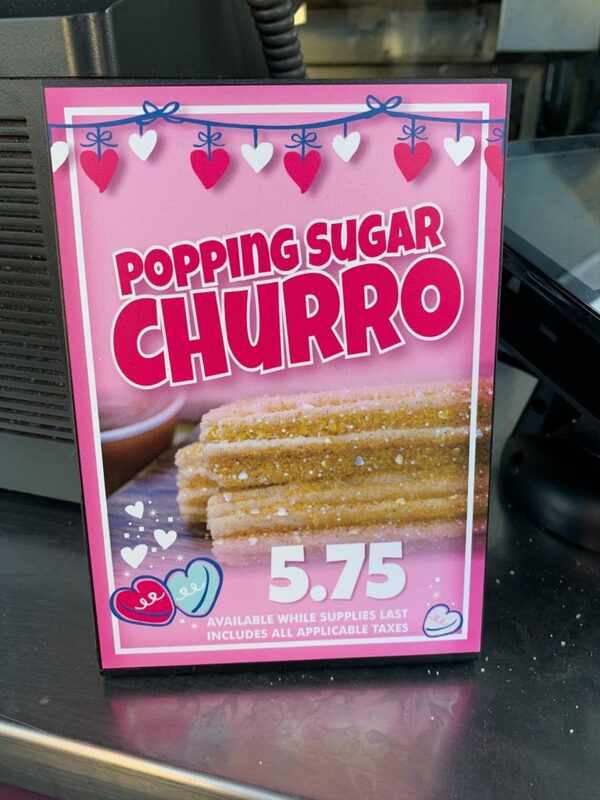 Popping Sugar Churro from the Churro Cart in Tomorrowland. EEK! 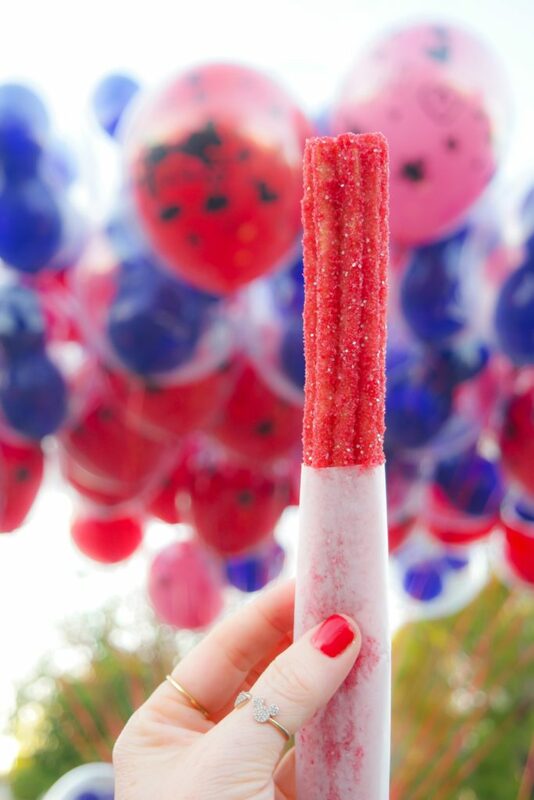 100% my new favorite churro (sorry chocolate churro). I LOVED the popping sugar!! The little pops in my mouth with each churro bite was fun. The popping candy is strawberry flavored and mixed with coarse sugar and edible glitter. 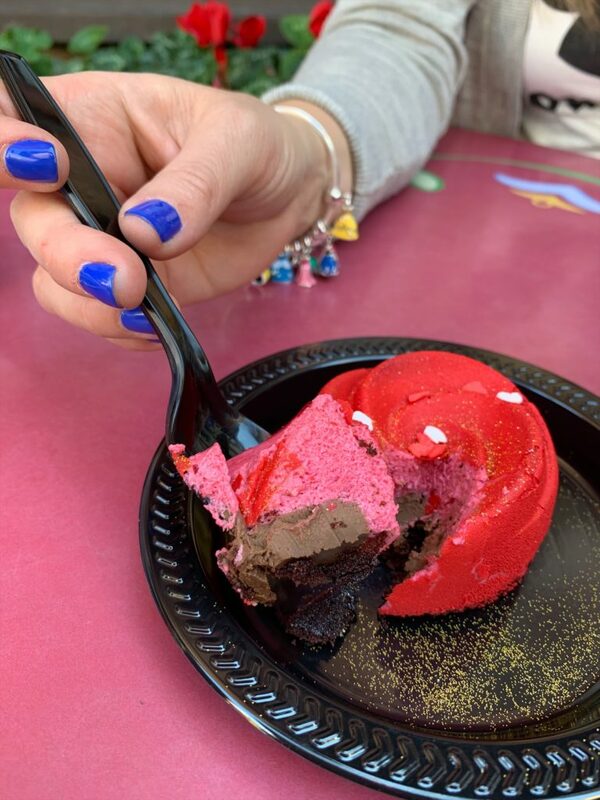 I did run out of time to try some of the items below that are also part of the Valentine’s Menu or some things like the donut weren’t available and Blue Bayou requires reservations and to be honest with you, it is so dark that it is far from a food bloggers dream to dine in the dark.